"My son is becoming weak day by day. Sometimes his heart beats so fast, I literally tremble when I hear it. He is always seen tired, he doesn't play or talk much. Doctors said he needs a surgery at the earliest. If left untreated he may get sudden cardiac arrest and lose his life". - Charles. 4-year-old Kanishkaran is deprived of even the smallest joy of playing outside or picking up new words every day. He wants to lie down even if he walks from one room to the other. The rumbling sound of his heart within few hours of his birth terrified everyone. Doctors found that the blood flow from the left side of his heart is restricted, depriving his body of oxygen, and causing abnormal blood pressure. "My wife took all the tests during pregnancy, everything was perfect. We were least prepared to hear this. Within few hours of his birth, he struggled to breathe and I went numb. Now this happens a few times everyday and we fear that he is going to suffocate to death any time." - Charles. Charles felt reassured when Kanishkaran's doctor suggested they wait a few years, by when the defect could correct itself. Until he turned 3, the only symptoms he showed were a little fatigue and shortness of breath. Suddenly, in the past year, the episodes have increased in frequency, and this 4-year-old is unable to move without feeling faint. Another follow up showed that his condition is getting worse, with his heart unable to beat normally and keep his body alive. At the hospital, Charles is by Kanishkaran's bedside all the time. His wife, Priyadarshini, went into shock after discovering that her son's life is in constant danger. She requires treatment to recover and therapy to overcome the overwhelming guilt. Charles manages to go to work for extra hours, and also care for his family on his own. He doesn't remember the last time he slept for more than 2 hours. As for Kanishkaran, he cries for hours begging to see his mother, and to have her holding him. 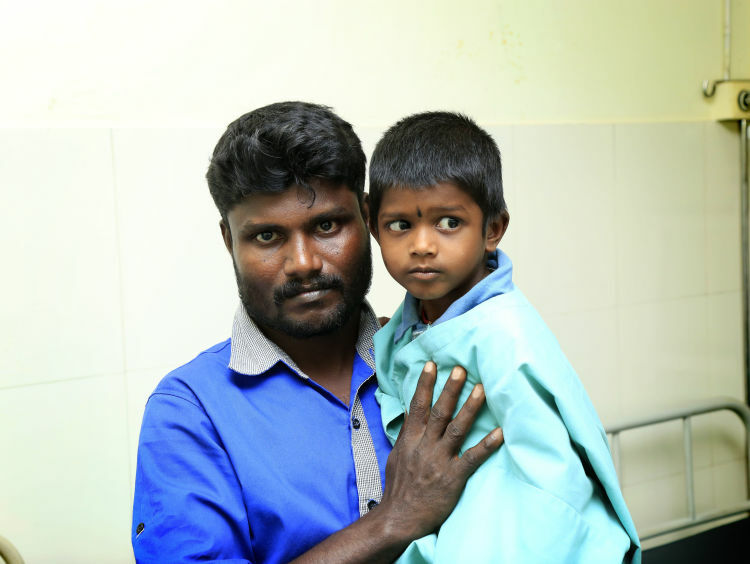 The heart condition has given Kanishkaran a perpetual cold and cough. To have the surgery that can fix this defect, Kanishkaran's congestion needs to clear up. Unfortunately, he is stuck in a chicken and egg situation where death can come looking for him any moment. Charles works as a mason for a daily wage. With medical expenses piling up every day since his son's birth, he has been living by the day on the little money that is left. Priyadarshini's condition has been getting worse but she is refusing treatment in order to save every rupee possible for her son. When Charles goes to work, his mother cares for Kanishkaran. "His fatigue stopped him from being like other kids. He never played. So, he has no friends. The children here call him a freak, and that depresses my son. He keeps crying all day, and starts gasping for breath every other minute. He says he wants this to end, but I don't know how to save him." - Charles. Charles earns Rs 400/day and he gets to work 4 days a week. The family has been skipping meals to save money for Kanishkaran's surgery which is estimated to cost Rs. 2 Lakhs. A few thousand they saved has gone towards emergency admission, tests and medications. Now, Charles has no option but to ask for help. Kanishkaran has not seen his mother in a while, and the fear is taking over his little body. His heart has a chance to recover, but he needs your support. Your contribution can give Kanishkaran a chance to live his life! Thank you for your love and support. 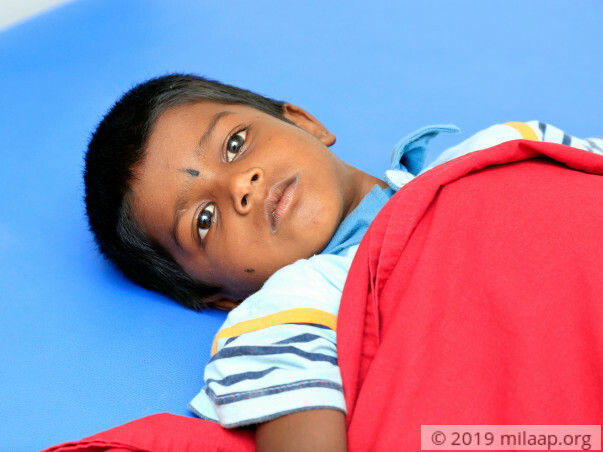 Kanishkaran underwent surgery on June 6th 2018 and now his condition has improved. His family is feeling blessed now and thank you for their support. 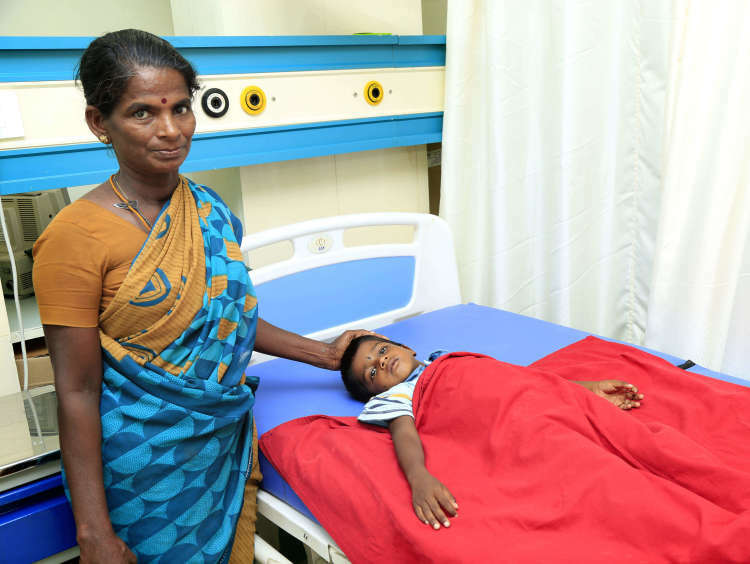 As of now, Kanishkaran's surgery is still pending but so far he's been responding well to the treatment. Doctors have suggested that the surgery may take place at the end of this month. We shall keep you all posted and inform you once the surgery takes place.